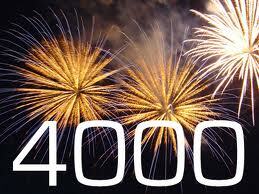 Four thousand-plus hits on the blog was reached either last night or this morning. Too bad I didn't have a contest or something. I pray that someone, somewhere was encouraged by my thoughts. If you have been reading this blog, please tell me in the comments section. If you feel especially daring, post a link to your favorite article. I'd love to hear from ya'll!